Efficient direct gas burners make use of all the energy Natural gas or liquefied petroleum gas characterised by exceptionally low emission rates are used as the fuel for Mepu direct gas burners. This allows leading the flue gases directly into the drying air, which means that no energy is lost. The power ratings of standard direct gas burners offered by Mepu range from 1,250 to 13,000kW which means that there is enough power for larger units as well. The power of the burners can be steplessly adjusted down all the way to ten per cent of the rated power. Overpressure furnaces ensure excellent efficiency The Mepu overpressure furnace range includes five options: 210kW, 250kW, 310kW, 400kW and 500kW. The furnace heat exchangers and flues are made of fire proof, stainless steel plate ensuring long service life to the furnaces. 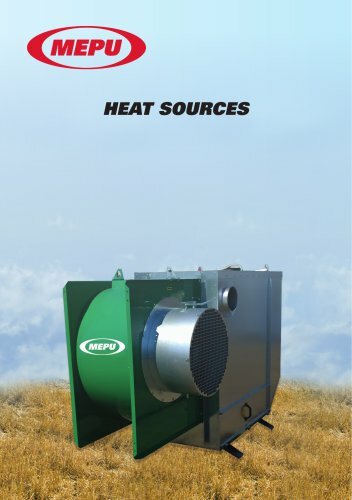 The efficiency of Mepu overpressure furnaces is one of the best on the market. All of the furnaces are equipped with Finnish-made Oilon oil burners.